Oh yeah. Hot pink head to toe--covering everything, including the face--catsuit, courtesy of the sick, sick mind of Ian Murphy, with a little too much help from his better half Char. Now, here's the thing... I have no shame sometimes. If I thought that I could use this thing to get a chitload of donations, I would vow to wear it at the B2B, or at least the first day of the SGK 3 Day. And that's what the Murfs had in mind. Aside from sticking it to me, that is. The problem is with the suit design. It covers my face. It covers my feet--which is a problem in terms of blisters. It covers my hands. 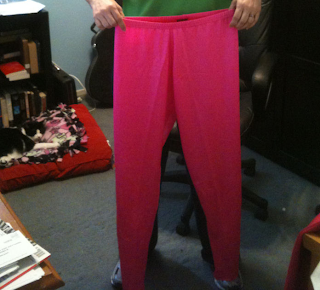 It's spandex, which means that as I sweat, it's gonna stick to me like toddler-flung snot. But the most important thing...peeing. This would make those potty breaks problematic. And having Diabetes Insipidus, that could be a major issue for me. Plus, I would overheat in it. The Murfs don't give up so easily. Because Charlie was afraid that the catsuit would not be delivered in time (since it was coming from freaking CHINA) she sent something else. That's still spandex, folks. Combine that with a hot pink t-shirt, black gym shorts, and another cape... let's just say I will feel like I'm standing out like a sore thumb. 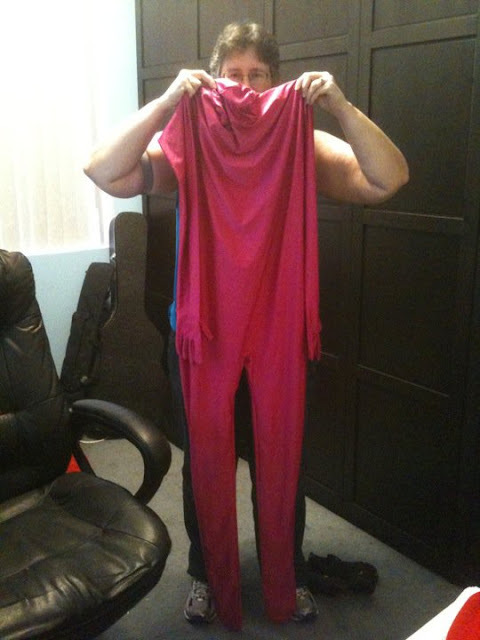 If I can reach my donation goal by my birthday--that's $2300 by August 26--I will wear my hot pink superhero costume for at least the first day of the San Francisco SGK 3 Day. If I reach it before my birthday, highest donor gets to decide what color I dye my hair...hot pink? Bleached blonde? I'll do it for a wad o'cash. And you bet there will be photographic proof. You make this SO tempting for the Woman but she's running around like crazy this year and just isn't sure she's supposed to do this! YOU ... in PINK ... from HEAD TO TOE!!!! Jeter and I are laffin an laffin! um ... is your blog background color pinker than usual? What else do you and Curt have to do at the end of October?????? I mean the "spouse thingy!" I don't think Curt wants to go walking with his mom and Mike is taking time off for the SF walk so he won't be able to get it off in October. 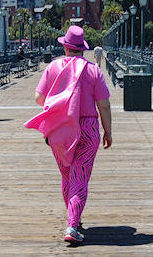 Thump, if you do 2 walks this year, I will buy you the pink tiger striped tights ;) I know you want them.